We can often see the huge English library on TV or movie. The bookshelf is set from bottom to top of the room. If you want to reach the book on the top, you shall climb ladder. It’s not suitable for our home to using this pattern. However, we can make use of ceiling’s space to build a bookshelf. 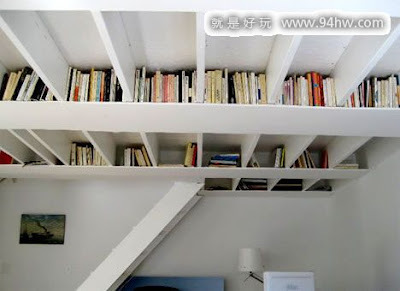 Although it’s not convenient to get books, it’s really a good place to place your old books. Nice collection you have for office furniture............its amazing!!!!!!!!!! !